As the holiday season is coming to a close I'm finding myself craving vegies and healthier snacks. Well...that's not wholly true... that Mac Nut Brittle is still sitting on it's pretty little plate just begging me to take a little nibble (or two!) and Mom's marshmallow filled Rocky Road gives me the eye every time I walk by. Not wanting the Rocky Road to feel left out I always make sure to take a little piece of it when I sample the brittle and everyone is happy! With New Years Eve just around the corner I'm working on appetizers to bring to our annual celebration, and after my holiday sweet overload these healthy Greek Skewers fit the bill. 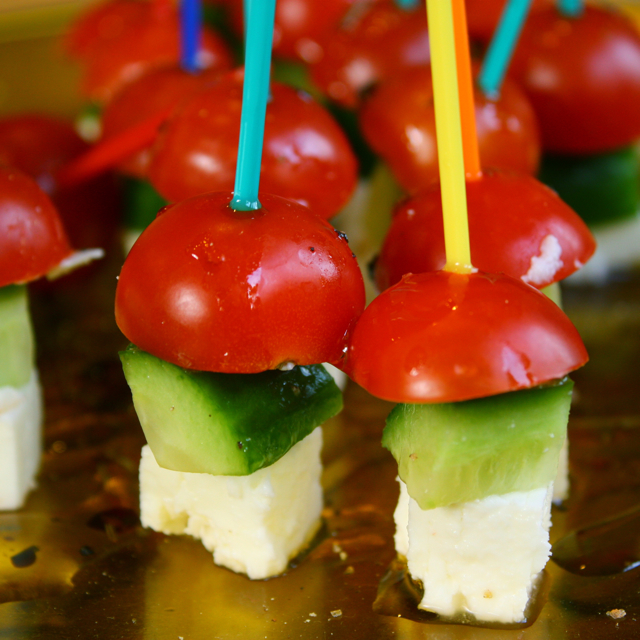 Fresh tomatoes and cucumber combine beautifully with cubed, salty feta. Drizzled with a touch of our favorite garlic dipping olive oil and a splash of balsamic, the trio come alive and simply burst with flavor. Easy assembly of these fresh and heart healthy ingredients is an added bonus making them the perfect "getting back on track" snack! Skewer a piece of tomato, the a piece of cucumber, and then a piece of cubed feta - sticking the tooth pick into but not all the way through the feta. Stand skewers on a serving plate and drizzle with the oil and balsamic. Serve! Photographer extraordinaire! I clicked on this before I even realized who the author was because I photo was stunning. Such a simple idea that has been elevated to elegantly delicious. I have been feeling the same way - it is time to get back on track. That means getting back to the gym and walking, eating more fruits and veggies and less cheesecake, and getting off the computer. This snack would not get me off track at all. Gorgeous colors! I love appetizers like this that are healthy and have a little cheese:)Happy New Year!! Beautiful! Perfect for the New Year...I could even eat them after midnight and stay on resolution! Have a Happy New Year and Great 2011! This recipe is a fabulously easy and tasty-sounding idea, though. 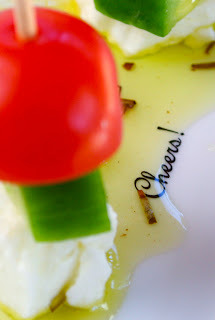 Could even substitute in fresh mozzarella if you don't feel like sticking with the greek theme (i <3 mozzarella + tomatoes)! I commented on this from your last post about how it was my favorite...thanks so much for posting how to make them. I just love these little treats, they look so yummy and I bet they have a great crunch! These are so stinking cute! Tasty too I'm sure. I must say your photos just keep getting better and better, you will have to do a tip post for us soon. I think you are just a natural though! Glad you got your voice back. Thanks Ann, Torvie & Kate! Felice, thank you! I love that, elegantly delicious! Yep... I've really got to get all of the sweets out of the house and get back on track. After New Years I keep saying! Becky, I think it is! Amy, I laughed out loud at that one... nicely said! Mary, I love the mozzarella idea! I actually have come in the fridge and may mix it up next time! Raven, I actually posted these because of your comment! Gina... it's the new light!! It makes all the difference in the world!! 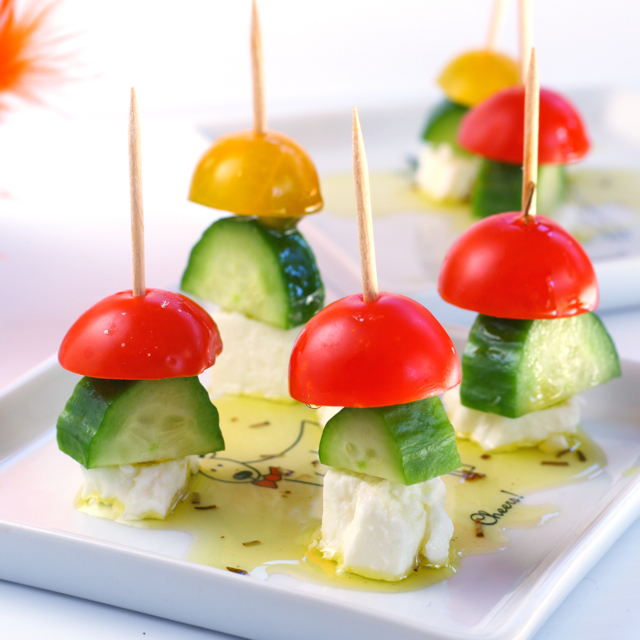 what a perfect little appetizer, I love feta! your little skewer combination looks delicious! This is a simple and elegant presentation of a healthy refreshing appetizer. You can't go wrong with feta, cucumber and tomato! I love feta cheese and your appetizers sound delicious. Love the colored skewers too. Simple, healthy, delicious and beautiful. These are true winners! I would love you to bring these to my New Years Eve party :-) Thank you so much for sharing with me. I hope you and your family have a happy New Year! Yay these made it on the Top 9! Congratulations! Although I'm not surprised. I bet these are delicious. So colorful and beautiful too! Kim! These look absolutely delightful and light to have :-) And super easy-peasy to make! Thank you so much for sharing. They're going to be a hit at your New Year's Eve fete ;-) Congrats on being in today's Top 9! Wonderful! I'm thinking of taking these beauties to our annual New Year's Day party! Thanks for sharing. Your photos are gorgeous - Congrats on the Top 9! Easy, tasty, healthy, pretty...Love it! I love cucumber/tomato flavor combo!! pretty pic! Congrats on food buzz top 9!! Congrats on Top 9!!! These are such a fresh and light app. Nice colors too. Perfect for entertaining for New Years. Thanks. Happy New Year!! Congrats on the top 9! Beautiful photos, and these sound so delicious and light :)! What a perfect appetizer idea! I love it. I wish I were more creative when it comes to stuff like this, it's a good thing there are foodies such as yourself to inspire me so! Garlic oil is a wonderful finishing touch! I made a variation of these, using tomato and mozzarella, for a gathering last night! Thanks for the idea! They are on my blog if you want to take a peek! Gorgeous pictures. I saw these in Fine Cooking. You done them proud!